Synthetic fibers have long been known to provide temperature-shrinkage crack resistance and post-first crack toughness to concrete and have been incorporated as secondary reinforcement in concrete since the late 1970’s. However, synthetic fibers have continued to evolve since their birth and advancements made with newer generations of synthetic fibers allow for greater enhancement to the long-term durability of the concrete by improving impact and abrasion resistance as well as increasing fatigue strength. All of these quantifiable benefits are critical in applications such as commercial or industrial warehouse slabs, where the concrete is subjected to repetitive, dynamic loads, and/or frictional forces. By adding hundreds of thousands of fibers to the concrete matrix, synthetic fiber reinforcement creates a three-dimensional support network, thus suspending all of the concrete ingredients in place — resulting in a more homogeneous concrete mix. In plain concrete, aggregates are subject to settling, which displaces water to the surface causing increased bleeding. This excess water at the surface of the concrete results in a weaker wearing surface, thus decreasing its abrasion resistance. By creating a more homogeneous mix, the three-dimensionally distributed fibers provide reinforcement to a concrete surface that resists a wide range of mechanical forces — from waterborne particulates rushing through and scraping against the concrete pipe to the frictional forces of a wood pallet being pushed across a warehouse floor. Fibers have demonstrated this enhanced hardness using ASTM C779/C944. By adding tensile strain capacity to the concrete and modifying the micro- and the micro-cracking mechanism by bridging cracks and inhibiting their propagation, fiber reinforcement significantly reduces the crack voids within the concrete matrix. This allows the concrete to act in a more ductile manner and enables greater impact absorption, as demonstrated by a test described in ACI 544.2, in which a 10-pound hammer dropped 18 inches imparts a dynamic load on a steel ball that transfers a point load to a concrete disk. The impact resistance is then measured by the number of blows it takes to induce first-crack and full failure of the disk. As discussed in ACI 544.1R Report on Fiber Reinforced Concrete Section 4.3.7.5, a study was conducted by M. Nagabhushanam, V. Ramakrishnan, and G. Vondran using the ACI Impact Test (originally published by the Transportation Research Record). 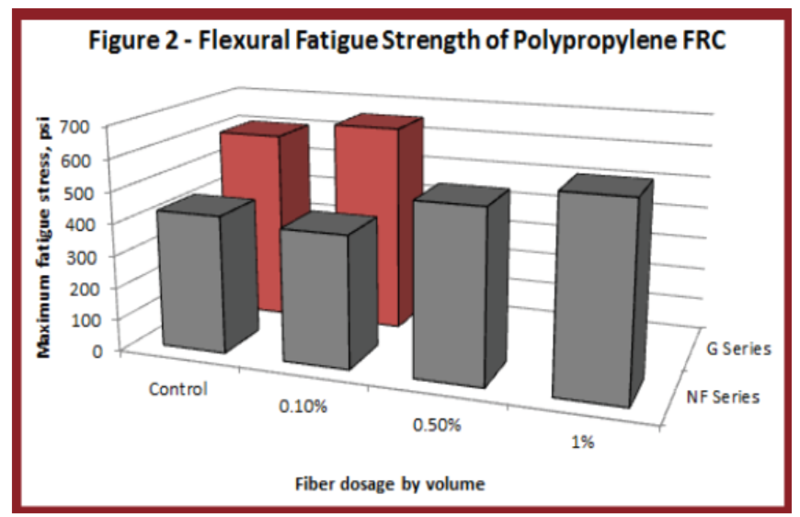 The study included varying dosages of polypropylene fiber (from 0.1 to 1.0% by volume) and two different mixture proportions (water-cement ratio of 0.4 for NF series and 0.5 for G series), and the polypropylene fiber reinforced concrete showed an improvement in fracture energy between 33 and 1000%. 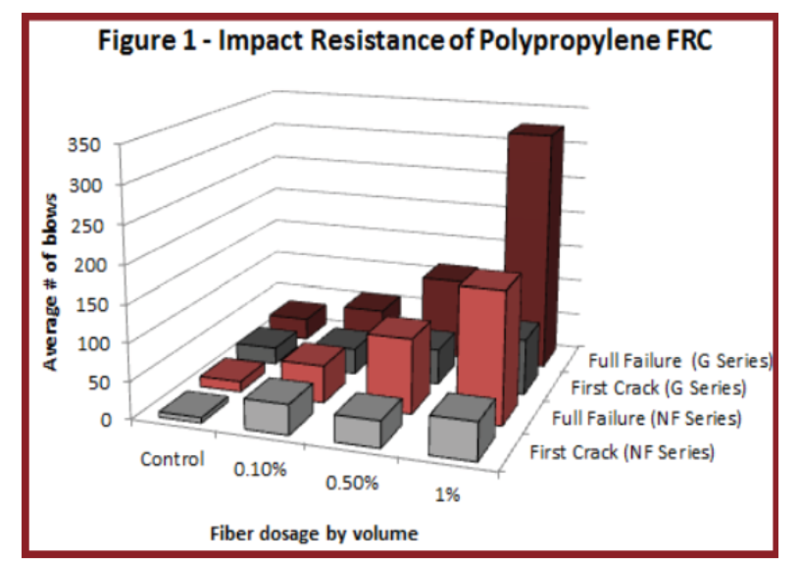 Incorporating polypropylene fibers, even at a lower dosage rate, significantly increased the number of blows to the first crack and to ultimate failure as compared to plain concrete, and impact strength improved with increasing fiber dosage. Results from the study have been replicated in Figure 1. By distributing the point load to a greater mass of concrete, the three-dimensional network of fibers distributes impact through a greater volume of the concrete as also exhibited in the rebar pull-out test. Furthermore, by allowing the concrete to act in a more ductile manner (increased Modulus of Elasticity), the flexural fatigue strength and the endurance limit of concrete slabs-on-ground can be increased significantly with the incorporation of polyolefin fiber reinforcement. For the discussion, the flexural fatigue strength is defined as the maximum flexural stress at which test beam can withstand two million cycles of the non-reversed repetitive uniform load. Similarly, the endurance limit is the maximum flexural stress at which the beam can withstand two million cycles of the non-reversed repetitive uniform load. Similarly, the endurance limit is the maximum flexural stress at which the beam can withstand two million cycles of non-reversed repetitive uniform load expressed as a percentage of the modulus of rupture of plain concrete determined in accordance with ASTM C78. In a research program discussed in ACI 544.1R Section 4.3.7.6, Fatigue Strength of Polypropylene Fiber Reinforced Concrete by G. L. Vondran, M. Nagabhushanam, and V. Ramakrishnan sought to determine the flexural fatigue strength of polypropylene FRC for an optimized mix proportion using cyclical non-reversed fatigue loading as described above. Results from the study have been replicated in Figure 2. As compared to plain concrete, the endurance limit increased by 16%, 18% and 38% for 0.1%, 0.5%, and 1.0% fiber content by volume respectively, and fatigue strength improved with increasing fiber content. Improved fatigue strength is critical in applications such as concrete pavements, bridge decks, overlays, and industrial floors where the concrete is subjected to similar fatigue load cycles, and it equates to a longer usable lifespan. The addition of polyolefin fibers significantly improves the durability of concrete slabs-on-grade by providing temperature-shrinkage crack reinforcement, post-first crack toughness, enhanced impact and abrasion resistance, and increased fatigue endurance, which equates to longer slab serviceability. For more information on the subject matter, please contact Bobby Zellers at rzellers@abcfibers.com or Rob Yates at rob@abcfibers.com.